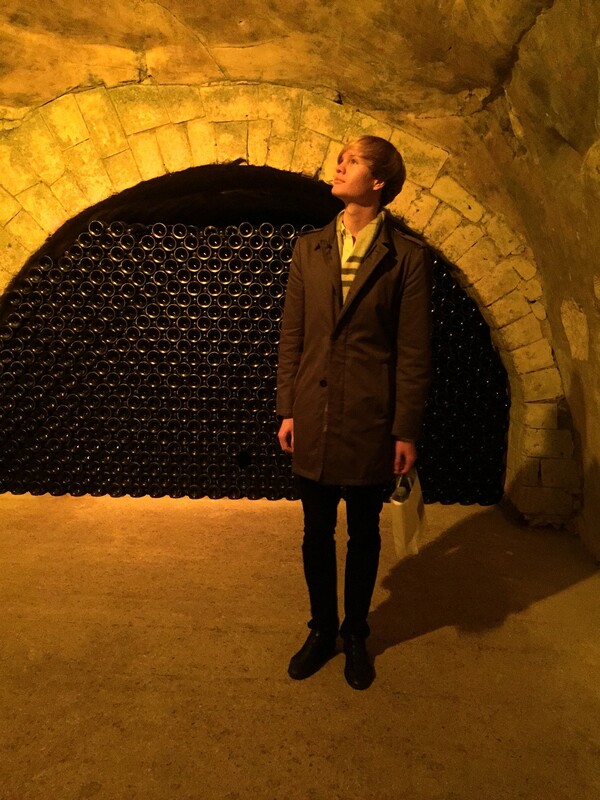 We visited the Taittinger Caves recently in Reims, a short 45 minute TGV away from Paris Gare de l’Est. 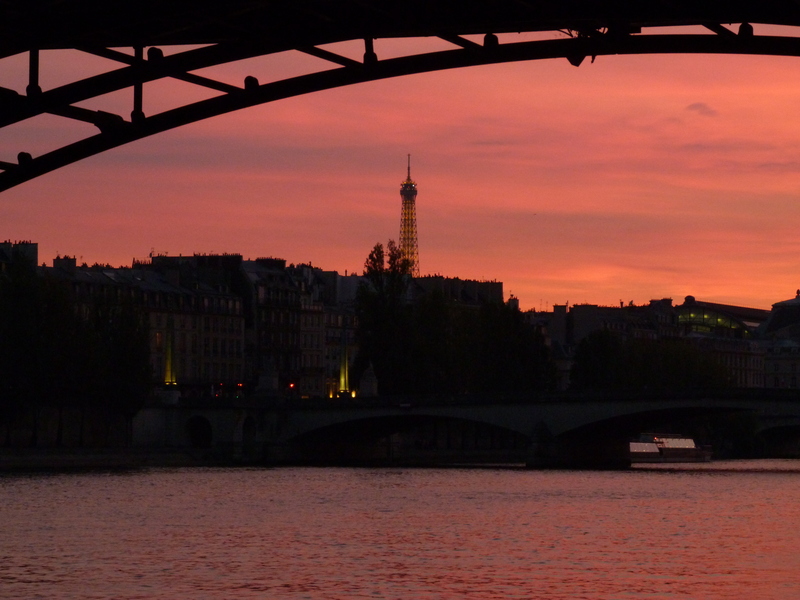 Three tasting options are available after the tour – the Brut Réserve, the Brut Réserve followed by the Rosé, the Prélude Cuvée Grands Crus, or the recently released Millésimé 2006, and the Brut Réserve followed by the fleuron of the Maison, the Comtes de Champagne 2004. 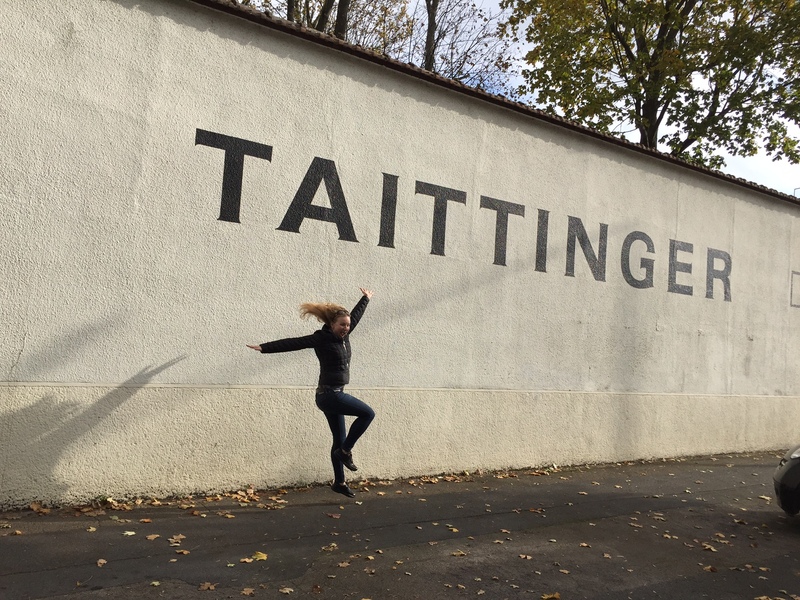 Once you have selected your desired tasting option, the visit – in either French or English – begins with a short video that outlines the history of the Taittinger family and gives a few key dates; beautiful images open one’s appetite for the tour just as a crisp Champagne would before a meal. 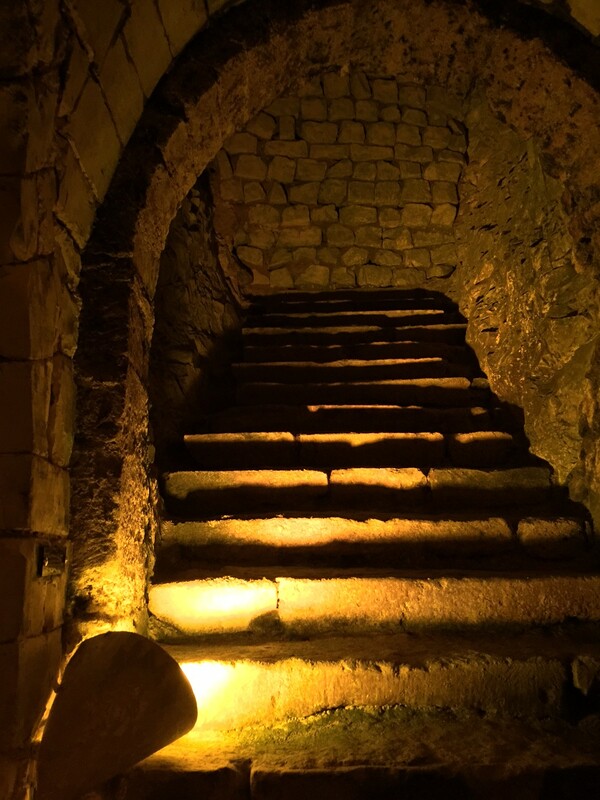 Our guide led us down a spiral staircase of 83 steps and welcomed us in the cool subterranean area, where we explored the ruins of the basilica, destroyed during the French Revolution, and a trio of original iron doors, exquisite metallurgy that that dated from the 3rd century. Deeper into the caves we explored, but spelunking this was not – flat, smooth floors, ample lighting, and sufficient space ensured our safety. 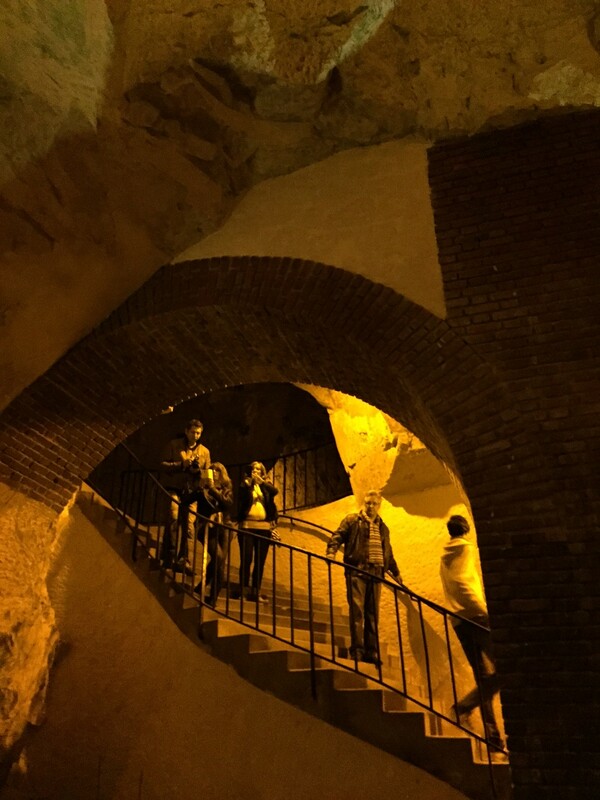 Only their highest cuvée, the Comtes de Champagne, exclusively millésimé and aged up to 10 years, slumbers here in the chalk caves. Horizontally whilst the lees are present in the bottle, and hand-turned, quarter by quarter turn and inverted so as to gently coax the sediment towards the neck of the bottle, where it is frozen and expulsed. 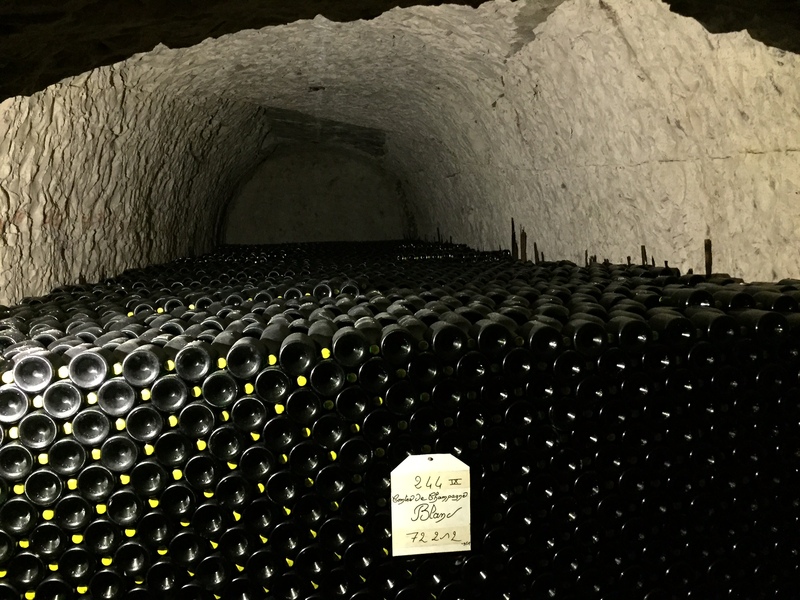 I inquired as to the percentage of loss – bottles that shattered due to fabrication weakness or external factors – this is generally 1 bottle per 15,000 – an acceptable margin – our guide pointed out empty spots in the otherwise perfect structure that was stacked 20 meters deep and held 72,212 bottles. To avoid injury, magnums and jeroboams are wrapped in plastic before being stacked. 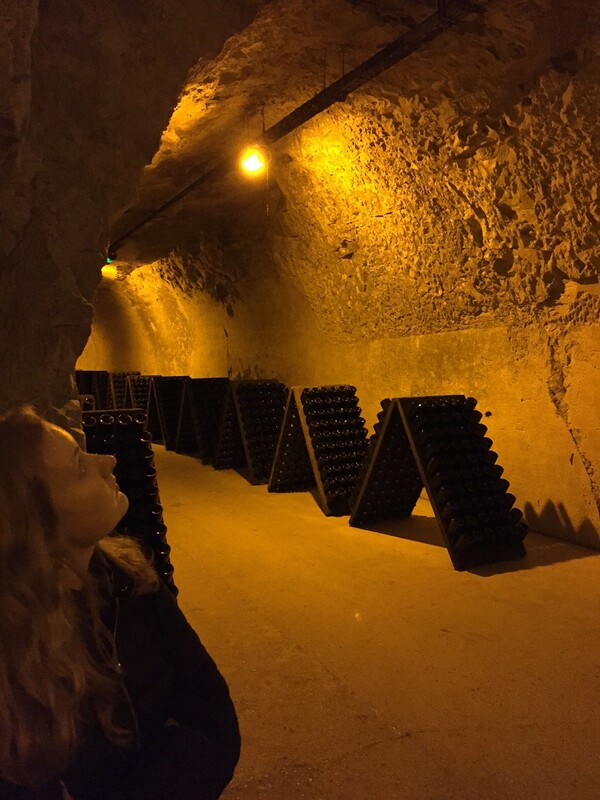 Something I did not know or had forgotten – for bottles larger than the Jeroboam (3 liters), they are created to order, and filled up from magnum bottles, which is why none of them were seen sleeping away in the caves. Deeper yet, down a staircase, we left the age of the monks and their basilica and entered into the realm of the Romans that first excavated the chalky soil of Reims – using inverted pyramids which brilliantly reduced the area of hard ground, while maximizing the amount of soft chalk that could be extracted. The process was repeated nearby, with careful measuring so as to leave columns of solid earth that to this day, support the crayères. 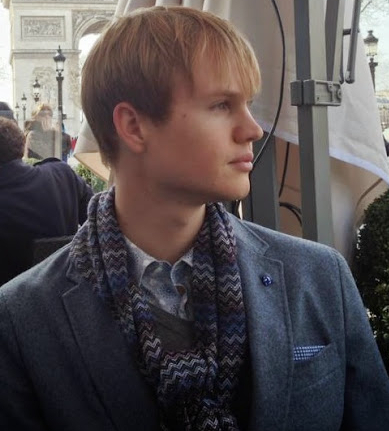 Returning to the surface to claim our reward, a tasting of the cuvées, accompanied by a sommelier who ever so poetically described the meteorological conditions, the blending from each parcel of each vineyard. 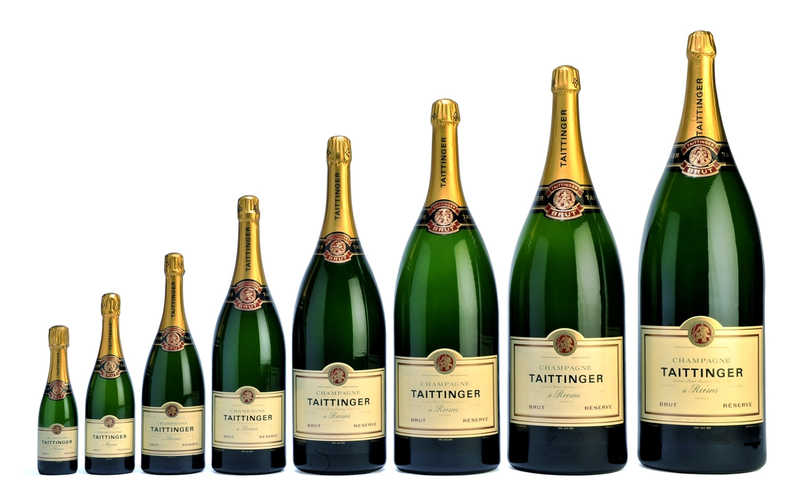 While Taittinger owns many hectares, they purchase from independent growers as well, and each parcel must be pressed separately, each grape variety on its own – so if Monsieur Viticulteur grows pinot noir, pinot meunier, and chardonnay on three parcels, that compounds into 9 different pressages and vinifications – a monumental task to thereafter blend so many different expressions of terroir into a single cuvée, one that is meant to be identical year after year. Bravo! Disclaimer – we paid in full for our own visits and compensation was not received; this is not a sponsored post and no partnership has been undertaken with the company mentioned.